Prairieville, the 2nd fastest growing rural city in America, is located in Ascension Parish, just south of Baton Rouge and north of Gonzales. What once was pastures, Prairieville has benefited from a population growth due to Hurricane Katrina and a job boom. In recent decades, Prairieville has benefited from residents being drawn to the award winning school zones and low crime rate and had an official 2010 census population of 26,895 inhabitants. Check out the many local places to eat, places to shop, things to do, and more in our attractions of Ascension Parish blog post. Looking to purchase a home in Prairieville? Check out our list of subdivisions by clicking here or click the below links to search for available homes in Prairieville. Visually oriented? No problem. 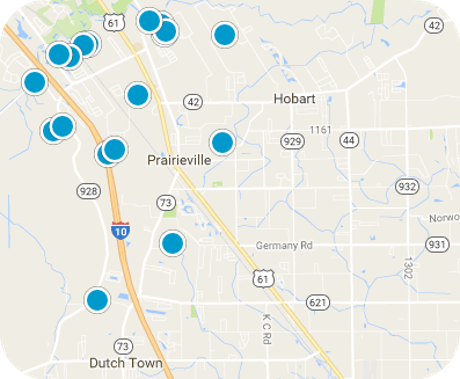 Take a look at our easy to use map of Prairieville homes for sale. Visit our city pages for more info! See your home's value instantly! Get your customized monthly market report here!